At the risk of sounding overly cliché, this is a perfect summertime grill. With a substantial 1,260 square inches of cooking space, your chicken, ribs, steaks and hot-dogs can cook in harmony alongside a bevy of vegetables and whatever else whets your appetite. The adjustable grate height is ideal for precision, temperature control, and the storage space below can accommodate just about any accessory or additional ingredients one could ask for in a proper cook-out. The reviews are overwhelmingly positive which makes this a solid buy. Fire it up right with the Char-Griller 5050 Duo Combo Grill. While grilling is wonderful, cleaning up afterward isn’t. The Char-Griller 5050 Duo Combo Grill features what is known as a Versatile Charcoal System, an adjustable charcoal grate that not only provides the grill-master with great heat control, but is also an easy to clean ash pan that you simply extract and dump post-grilling. Couple this with the handy grate lifter that comes included and wrapping up after a long day of beer and burgers has never been easier. One the top selling features of The Char-Griller 5050 Duo Combo Grill is its sheer space. This grill offers a generous 438 square inches of gas powered cooking area, and 580 square inches of your basic charcoal area. The porcelain coated grates are cast iron which are fantastic at retaining heat and also easy to clean. Couple all this with warming racks on both the charcoal and gas sides and you have a hefty 1,260 square inches of total cooking space with this grill. Consider the smaller version of this grill if you do not need this much space; the Char-Griller E5030 Combination Grill is perfect for smaller families. 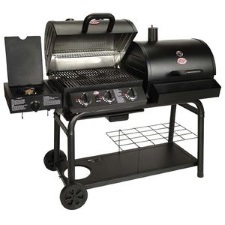 The Char-Griller 5050 Duo Combo Grill is charcoal and/or propane fueled, fabricated with heavy steel featuring porcelain coated cast iron cooking grates. This grill weighs in at 144 pounds and is 61” x 28” x 50”. A 40,800 BTU gas grill, the Char-Griller 5050 Duo Combo Grill comes equipped with an electronic ignition, 3 burners, and a side burner churning out an additional 12,000 BTU. The grate height is adjustable for ideal temperature control coupled with a chrome-plated warming rack. Generous storage area beneath for all requisite grilling accessories. The positives outweighed the negatives by far with the Char-Griller 5050 Duo Combo Grill so one can only assume the assembly is probably not overly cumbersome and the grilling experience enjoyable. In summary, the Char-Griller Duo Combo Grill is a nice option if you are a regular grill aficionado seeking a high-performance apparatus to cook multiple types of food simultaneously, especially for groups of people. It is easy to clean, offers both gas and charcoal cooking options, and appears to be a great buy according to a host of happy customers.